Note that these event handlers are also available for the Canvas. To play this mini golf app, the player first positions his/her ball within the confines of the tee, and then flings the ball toward the hole. The ball will bounce off of the rectangular obstacle and the sides of the course. For each fling of the ball, the stroke count goes up by one. The total score is the number of strokes it takes to complete the entire course. 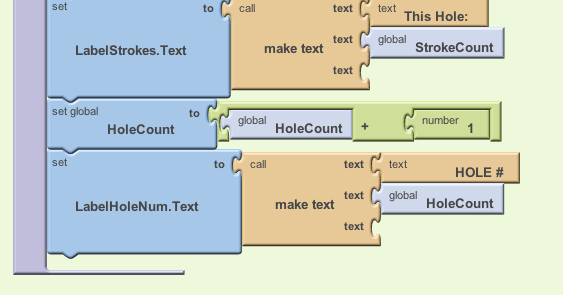 This tutorial assumes you are familiar with the basics of App Inventor-- using the Component Designer to build a user interface, and using the Blocks Editor to specify the app's behavior. If you are not familiar with the basics, try stepping through some of the basic tutorials before continuing. We'll build this app in stages, adding a little bit of the game at a time. 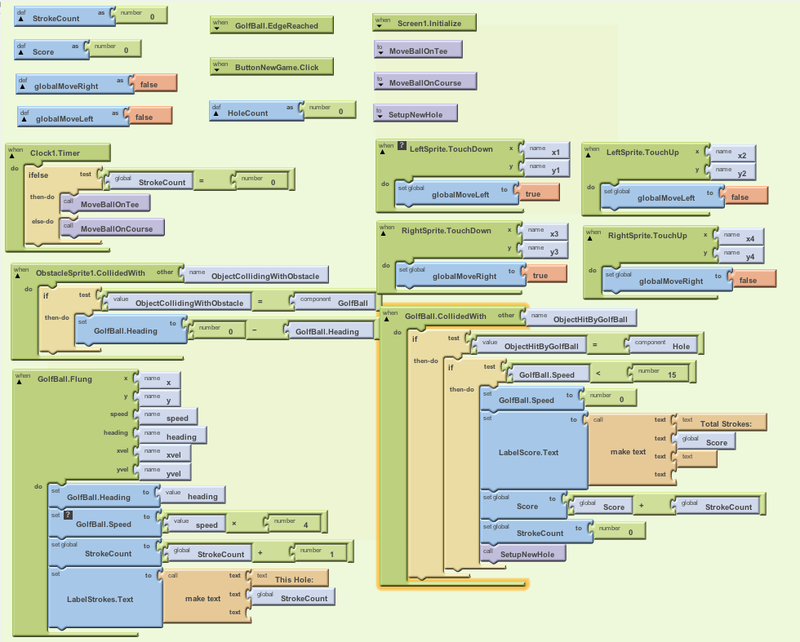 Log into App Inventor and start a new project. Name it "MiniGolf". When the Design window opens notice that App Inventor automatically names the screen "Screen1", but you can set the Title of the screen, which will show up in the top bar of the app. Think of a title related to Mini Golf, or feel free to use the suggested title "Flingit Mini Golf", and type it into the Properties pane on the right side of the Designer. In the Screen Properties (shown in right-hand pane): Uncheck the checkbox labeled "Scrollable" so that the screen will not scroll when the app is running. Screens that are set to scroll do not have a height. 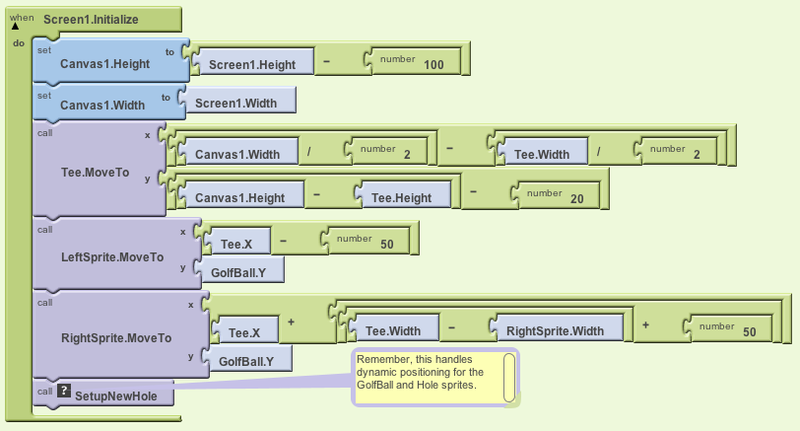 We’ll need our screen to have a defined height in order to set up the golf course properly. First, use the GolfBall.Flung event handler to move the golf ball when it is flung. Essentially, set the GolfBall sprite’s speed and heading to match the speed and heading of the player’s fling gesture. You may want to scale up the speed a little bit because the speed of the fling is a little slower than how a golf ball would move. You can play with this "scaling factor" to make the ball more or less responsive to a fling. Use timer event to slow ball down so it doesn’t bounce around forever. Each time the clock fires, it will reduce the speed of the ball slightly. Notice that if the ball is not moving then these blocks will do nothing. If you don’t have this then the ball will just bounce forever. This procedure will be called when a hole is scored and the ball has to be placed back at the starting point. Note that the Hole.MoveTo block sets the hole up in a new random location for the next play. 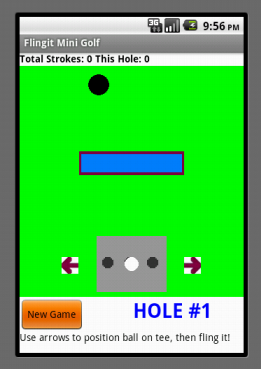 Program the Behavior of the Hole: When the ball collides with the hole, the ball disappears and resets at the bottom of the screen. 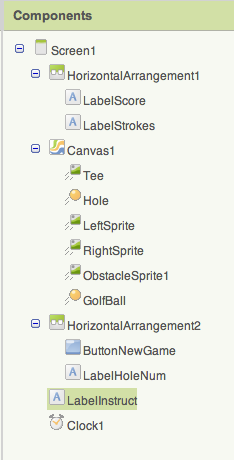 Note: When you first drag out the GolfBall.CollidedWith event handler, the named parameter is called "other". You can rename this by clicking once on the word "other" and typing in something new. 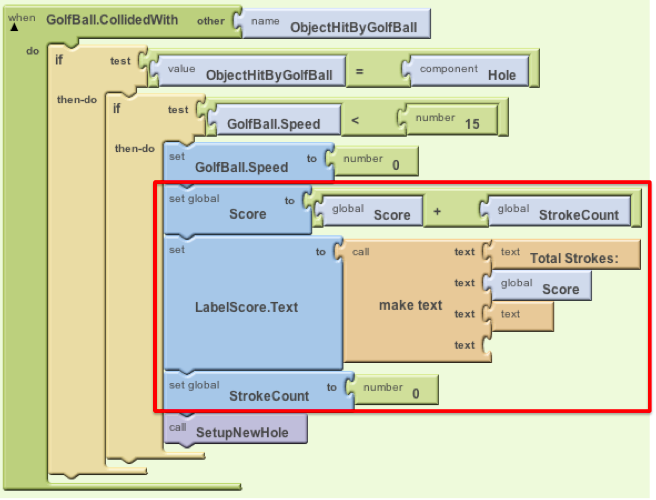 Use a name that makes sense, as in this example where we use "ObjectHitByGolfBall". Notice that the if then block tests to see if the object involved in the collision with the golf ball (ObjectHitByGolfBall) is the black ball sprite representing the hole. You can't just put a text block with the word "Hole" in it, you must use the component Hole block, that can be found in the Hole drawer under "My Blocks". Do not use a text block here. Test this Behavior. Connect your device to AppInventor, or start the emulator to load your app. When you fling the ball it should move in the direction of your fling, with a speed similar to the strength of your fling. The ball should slow down as it moves, eventually stopping. When the ball hits the hole, the ball should reset at the bottom of the screen and the hole should move to a new random location. Does your ball get stuck if it hits the edge? This is easy to fix with the when EdgeReached event. Note that you can find the "edge" value block under My Definitions. You can also use a developer’s shortcut by clicking anywhere on the workspace background and typing the word "edge". You’ll see a dropdown box appear. If you click the word "edge" you’ll see the value edge block appear on the screen. Big time saver! Double check to make sure your code is right: fling the ball a few times and see that that ball now bounces off the edges of the course. Games are more fun if you have a way to see how you’re doing. Let’s add a stroke counter. In mini golf your score goes up as you take more strokes. The goal is to have the lowest score possible. Let’s show the player how many strokes she or he has taken on this hole. Let’s also show the number of strokes taken during the whole game. In the Blocks Editor, you can program updates to the Score and Stroke labels. First, set two new global variables called StrokeCount and Score, and set their initial values to 0. Test the behavior. With these new changes, you should have a "Total Strokes" count and "This Hole" count at the top of the screen. When you fling the ball, the "This Hole" count  and "Total Strokes" count should both increase by one, and when you make the ball go into the hole the "This Hole" count should reset to 0. Ok, so now you’ve got a working game! Now let’s make it a little more interesting and fun. First we’ll add a Tee and let the player position the golf ball on the tee before they fling the ball. A rectangular area in which the player can position their ball before teeing off. 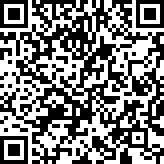 Upload the Tee image (right click on this link, or see below). First, program the setup of these components on the screen. It’s best to accommodate all different screen sizes by placing the sprites on the screen relative to the size of the screen. The blocks below show how to set up the screen dynamically so that everything fits the right way. We start off by making the canvas size based on the screen size, and then we place each sprite in relation to the width and height of the canvas. Try to understand all of these blocks before you move on. To handle this, first set up two global variables that are toggled each time an arrow is pressed. The left and right arrows are image sprites, so they come equipped with the ability to know when the player is is holding his/her finger down on them. 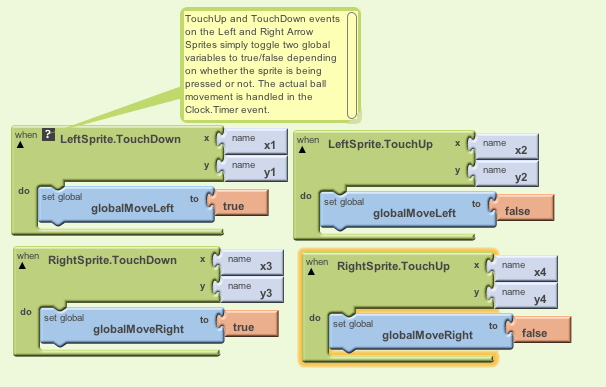 The following blocks toggle the global variables based on whether the user is pressing either of these arrows. 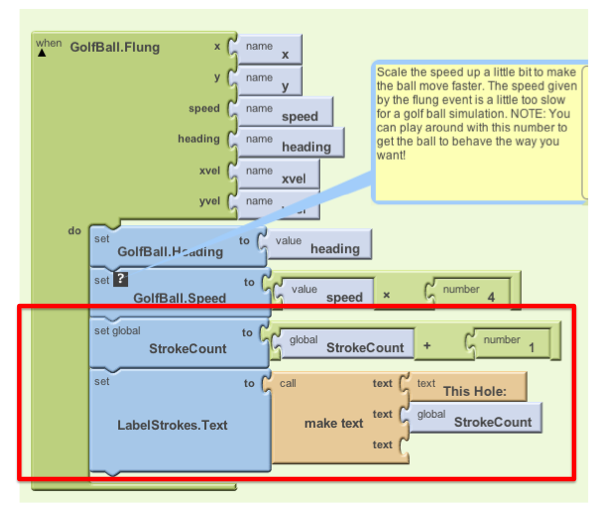 Make a new procedure MoveBallOnTee that makes the golf ball move left or right on the tee depending on the global variables. Although the math here looks complicated, it’s pretty simple. If the ball is supposed to move left, you first check to make sure that moving the ball 2 pixels left will not exceed the left-most coordinate of the Tee. If moving the golf ball to the right, you first check that moving the ball right 2 pixels will not move it past the right-most coordinate of the Tee. On each new course, players can position the ball on the tee before attempting to fling the ball toward the hole. To program this, you first have to check to make sure this is a new course and the ball has not been flung yet. If StrokeCount = 0 then we know this course is brand new and the player has not yet attempted to get the ball into the hole. As the blocks above show, after verifying that the StrokeCount is 0, you then want to proceed to move the golf ball left or right depending on which arrow is being pressed. Test the behavior. Make sure your app is doing what you expect: play the game on your device or emulator. Before you tee off, are you able to move the ball left and right on the tee by using the left and right arrows? After you tee off, you should no longer be able to use the left and right arrows (pressing them will do nothing). After the ball goes into the hole and the screen resets, you should then be able to move the ball left and right on the tee before teeing off again. Resets the game to Hole #1 with a score of 0. Displays the current hole number, increments by one each time a hole is completed. Text = "Hole # 1"
Text = "Use arrows to position ball on tee. Hit the ball by flinging it with your finger." Go back to your device or emulator and play the game some more. Now you should see the Hole # displayed in the lower right. Hitting "New Game" button should reset the game, returning both scores to 0, resetting the screen, and setting the Hole number to #1. Most mini golf courses have obstacles on them. Let’s add a simple rectangular obstacle that will randomly position itself on the course somewhere between the Tee and the Hole. Each time a new course is presented, the obstacle will move, just the same way the Hole moves each time a new course is set up. Upload the obstacle (rectangle) graphic (right click on this link, or see below). 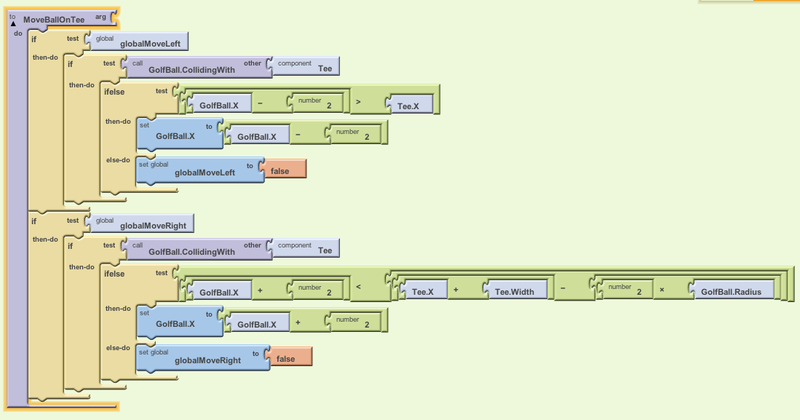 Program the behavior of the obstacle in the blocks editor. First, set the behavior for when the ball hits the obstacle. *Note: Using Heading = 0 - heading works because we are dealing with bouncing off of horizonal surfaces, this will not work for bouncing off of vertical or inclined surfaces. For our purposes, it works all right. See Challenge #2 below for more information. Test the behavior. Play the game again. Notice that the ball bounces off when it hits the obstacle. When the ball goes into the hole, or when the New Game button is pressed, the obstacle appears in a new location somewhere between the tee and the hole. That’s it! Share your game with friends by building an APK or by downloading the source and sharing the zip file with other App Inventors! Here are some extra challenges to make your game better. 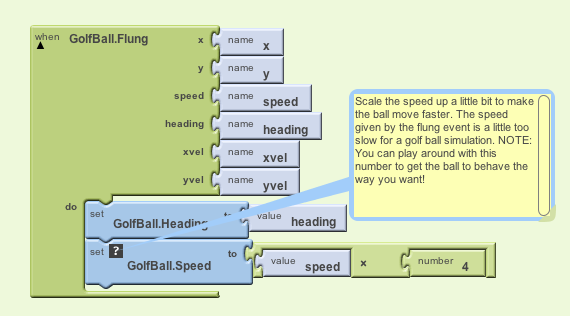 Challenge 1: Program the Ball to Hole collision so that the ball only goes into the hole if the golf ball’s speed is not too fast. In real mini golf, the ball will bounce right over the hole if you hit the ball too hard. Challenge 2: There is a slight bug when the ball hits the vertical sides of obstacle. Figure out how to program the ball to obstacle collision so that it bounces the way you would expect when the ball hits the vertical sides. If you'd like to work with this sample in App Inventor, download the source code to your computer, then open App Inventor, go to the My Projects page, and choose More Actions | Upload Source. Done with Mini Golf? Return to the other tutorials.